Looking for your family experience a mini-vacation this spring break at a fun-filled family paradise, where it’s always 82 degrees? 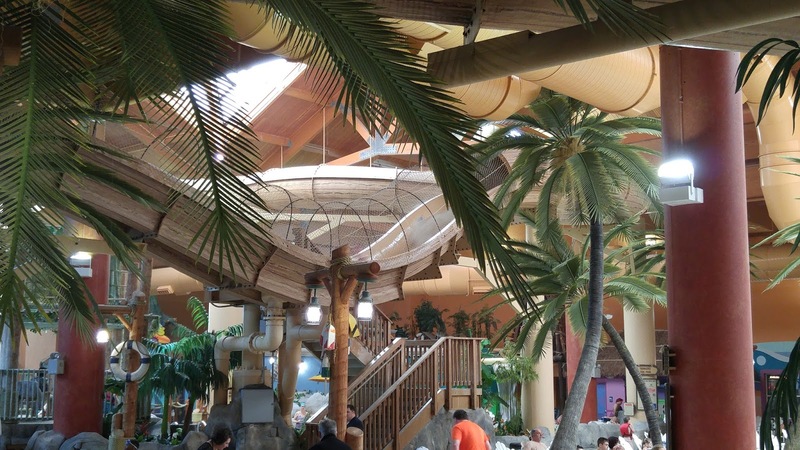 Castaway Bay houses a 38,000-square-foot indoor water park with activities for all ages, an arcade and more. Cedar Point's Castaway Bay is a tropical Caribbean themed resort and water park. 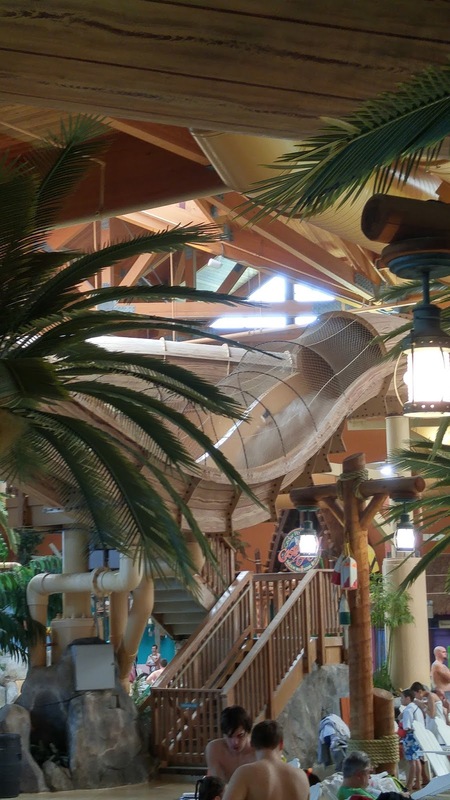 It features, a pirate ship when you walk in, singing parrots, an arcade, a craft and child activity center, three restaurants, retail shops and much much more! Cedar Point's Castaway Bay water park has something for everyone, even down to the littlest guest! 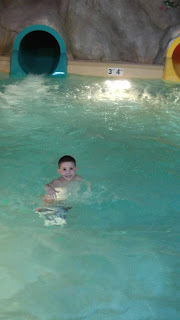 When you walk in the first thing you see is the Toddler`s Tide Pool. 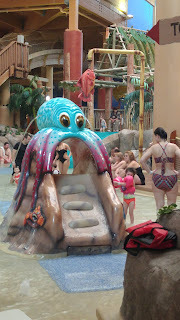 It has slides, water pipes, spraying gadgets and sea creature to play on! Must be less than 52 inches tall in bare feet or accompanied by a child to participate. 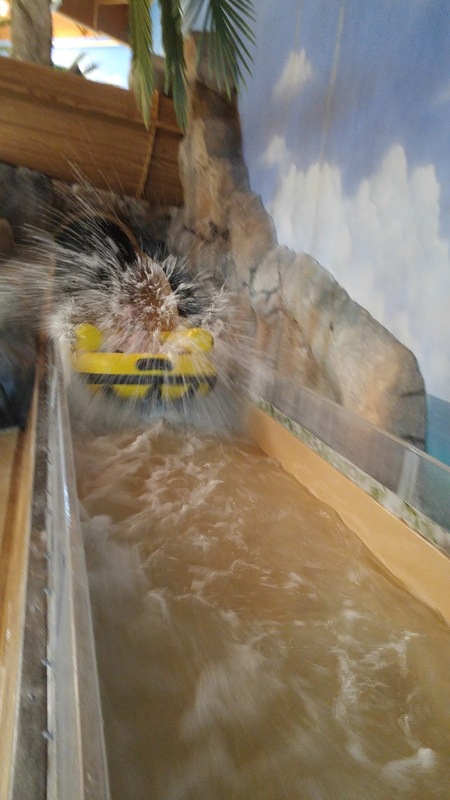 Cargo Crossing is an interactive play area in which guests have to cross a pool of water using floating lily pads and a cargo net. 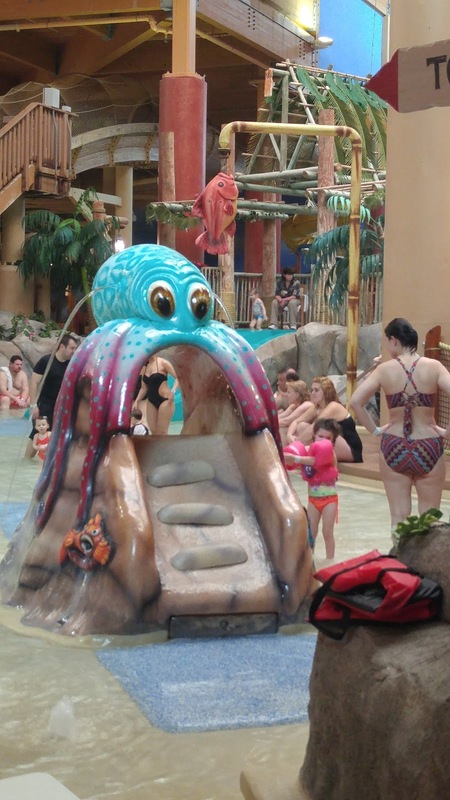 Creature Cove is a pool area offers basketball hoops and numerous flotation devices in the shapes of water creatures. My daughter made some new friends hanging out in here and it was fun to sit back in a chair and watch them play! 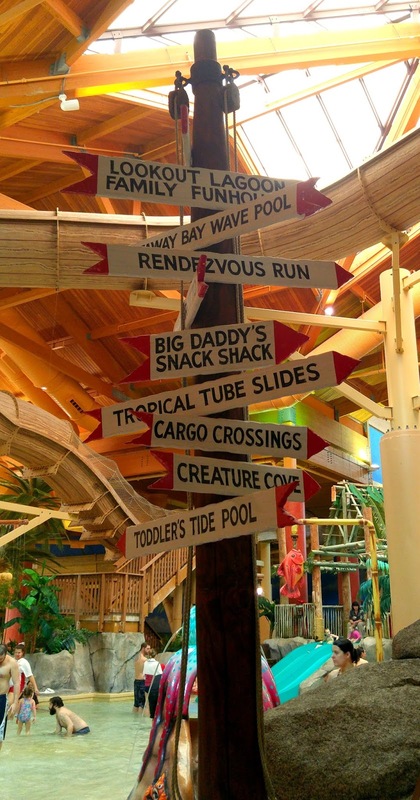 Lookout Lagoon Family Funhouse is a huge multi-story play area including a 1,000-gallon tipping bucket that drenches guests every two minutes with a downpour of water, four water slides and tons of interactive play! The Wave Pool generates 3-foot-tall waves which allows guests to jump and play, body surf and get knocked around. Tropical Tube Slides are three indoor/outdoor covered body slides. My son has finally gotten tall enough that he could ride most amusement park rides, so that meant the same for water slides! 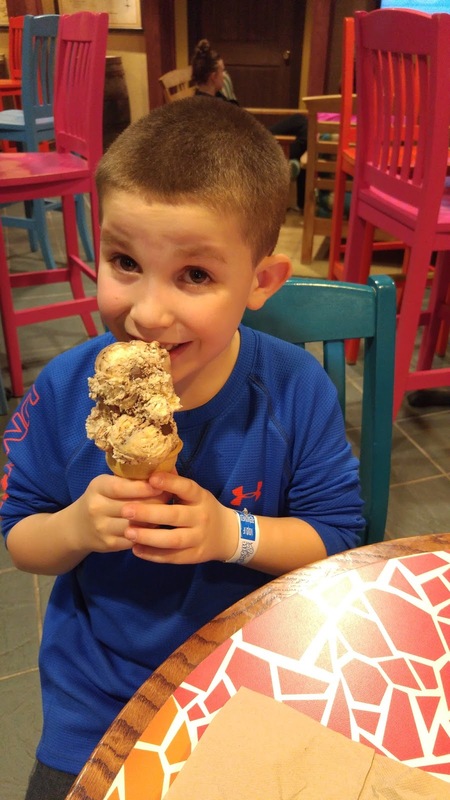 Not sure how he did it, but he went up and those steps time after time to try each tub. I think at one point he must of did them 8 times in a row. There was no wait! This was the only time we had to wait, but it was well worth it! 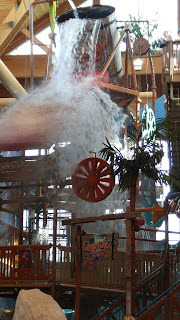 Rendezvous Run a 35-foot-high, 520-foot-long water roller coaster that propels riders uphill using water jets. 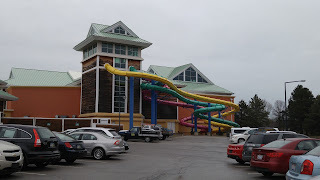 This unique water coaster twists its way through the waterpark, shoots outside the resort’s structure in an enclosed slide and then spirals back into the complex. 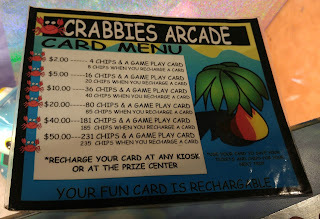 Crabbie's Quarterdeck Arcade is a sweet arcade and provides tons of fun for families. It was a fun way to unwind! 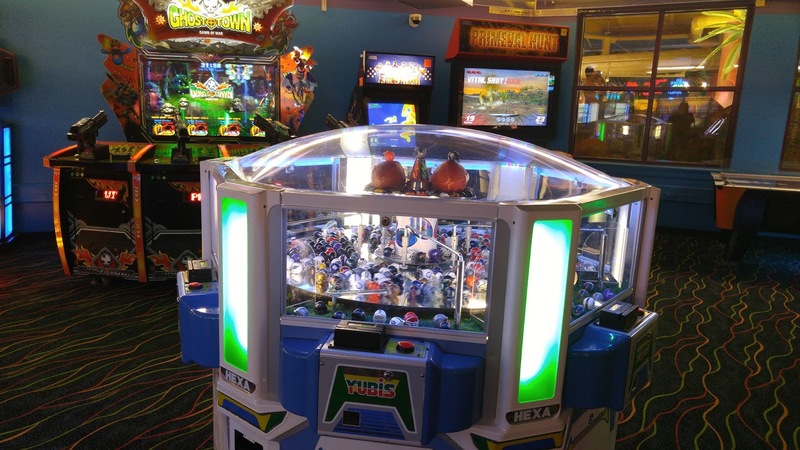 The arcade is paperless, so you purchase reloadable cards that track your ticket wins as well. When you spend more, you get bonus tokens, Just look at the above image too see how many tokens you can get for your money! 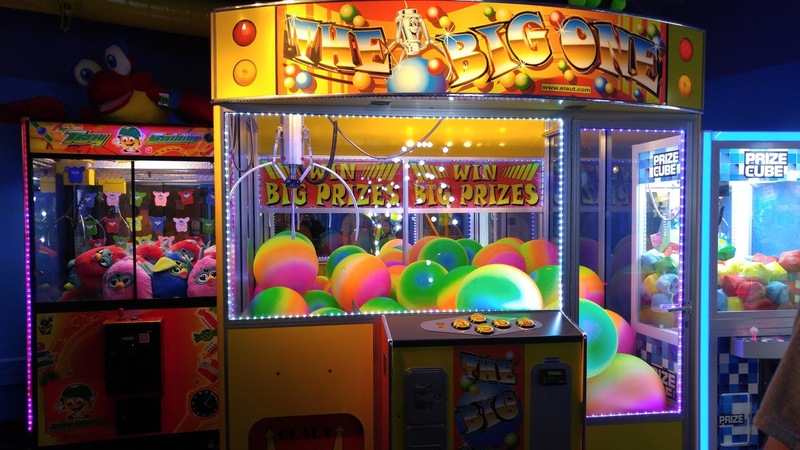 It has the latest video games, claw machines, photo booths, basketball, air hockey and ticket redemption games, there is something for the entire family to enjoy. 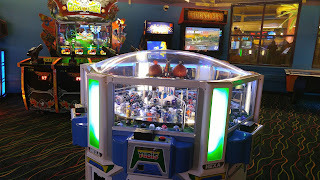 After you are done playing just turn in your card and redeem your points for fun items. 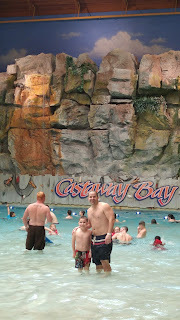 Castaway Bay has 237 hotel rooms and suites including family-oriented units. 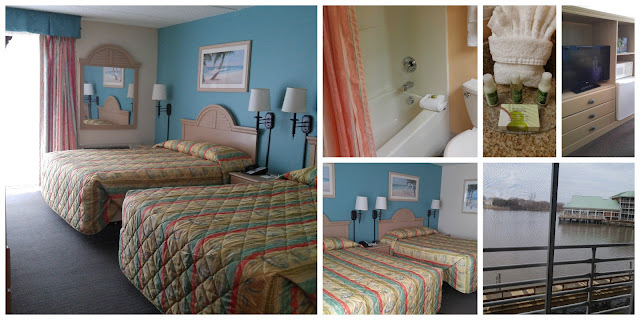 We stayed in a Pelican room on our visit! Our room was spacious with two queen beds, bathroom, fridge, microwave, table area and a balcony! The kids didn't mind sharing a bed, they were so tired, they crashed immediately after a fun filled day! 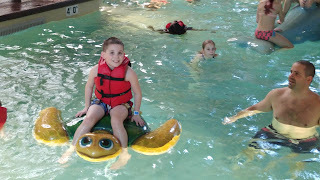 There are so many fun activities for kids and families through out the day into the evening! Make sure you pick up an Island Times newsletter at the front desk, so you are aware of all the times and activities each day! You are the artist and color designer of your own Castaway Bay souvenir t-shirt or cool bacpack! 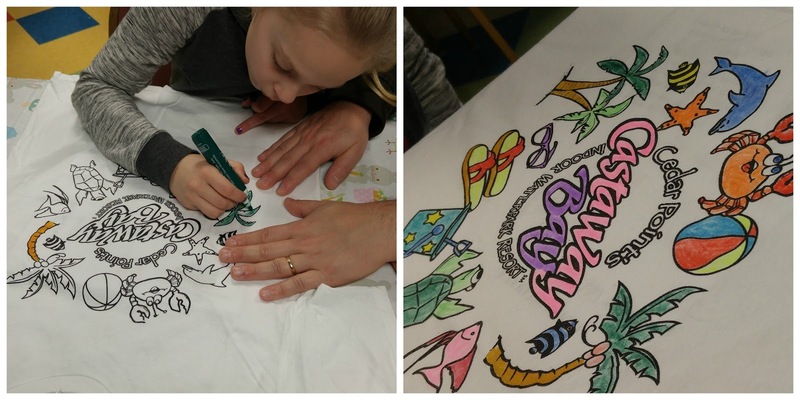 Families can also work together to color their very own Castaway Bay beach towel. 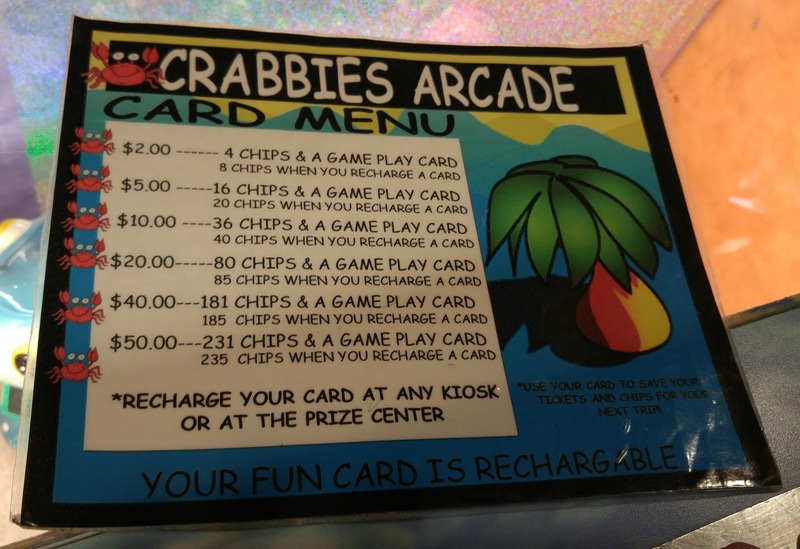 This activity has an additional charge. Meet Snoopy and the Peanuts Gang! 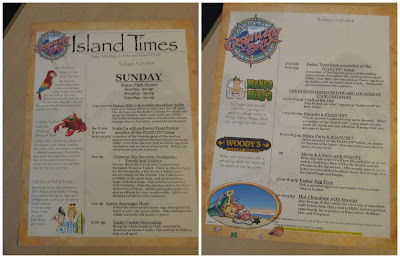 The can be found in the main lobby and while they stroll around the resort! 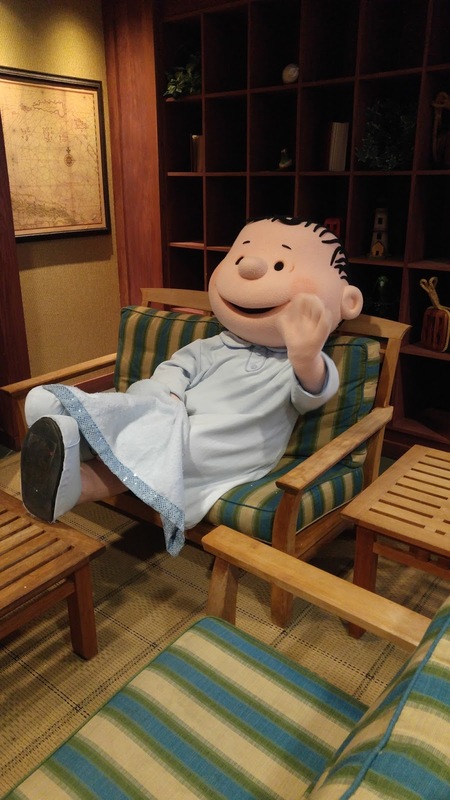 We found Linus in Ebbs and Eddies! 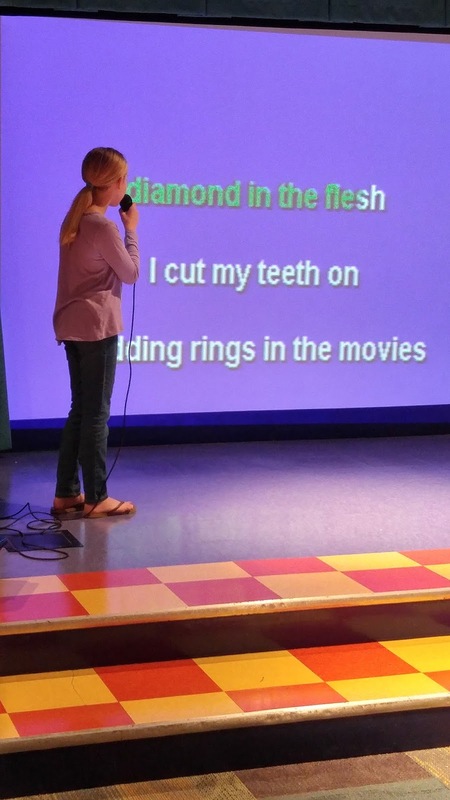 Warm up your vocals and step up to the mic! 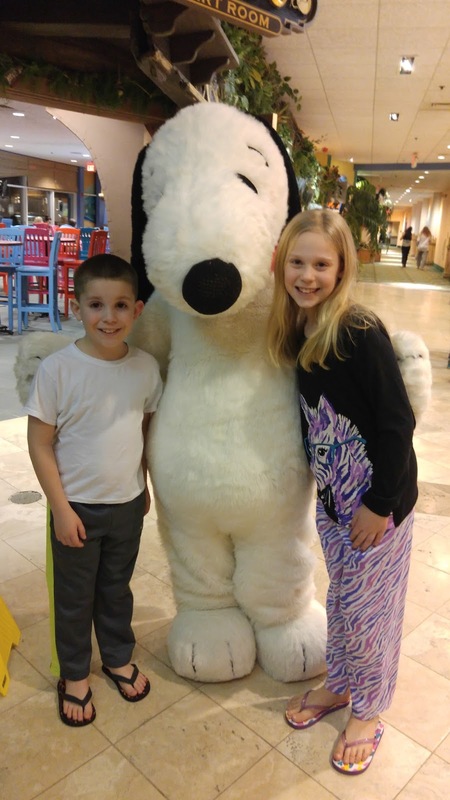 You may even get Snoopy to move & groove to a tune that you choose! Do the cha-cha and move and groove with a member of the PEANUTS™! Grab a partner and come on down to dance! Big Daddy's is located within the waterpark. Menu items include pizza, wings and breadsticks, hot dogs, warm pretzels with cheese, fresh made deli sandwiches, nachos with cheese, salads, soft serve ice cream, cookies, beer, soft drinks and ICEE frozen drink. 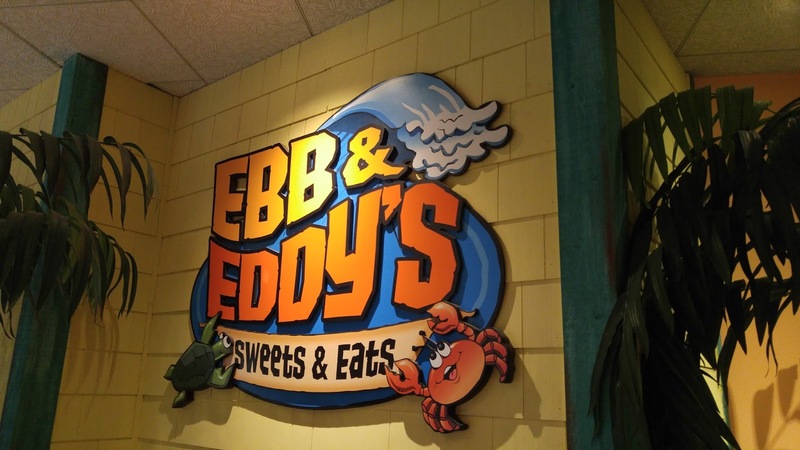 Ebb & Eddy'sEbb & Eddy's features quick service breakfast items, fresh bakery selections, deli wraps, salads, ice cream, assorted cold beverages, Starbucks coffee and other assorted hot beverages. 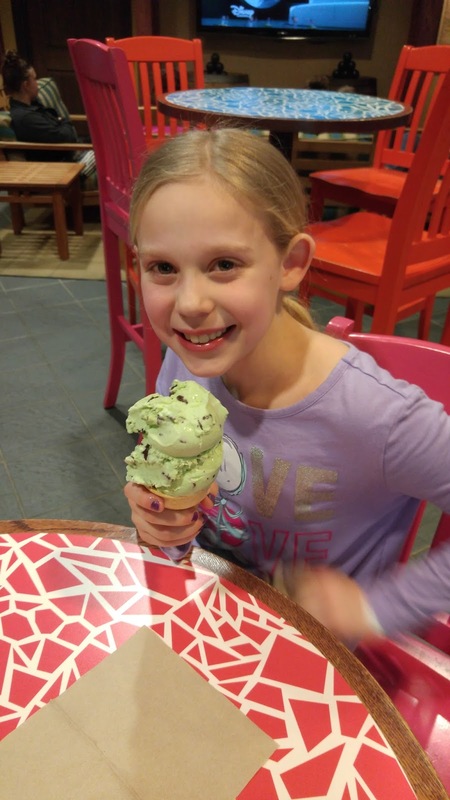 The ice cream is amazing, we treated the kids to a single cone after they were all sweaty from their dance party! The single cones were like $2.50 each! Here is a tip! Donuts are two for the price of one after 6pm! We went after 6pm and picked up 4 donuts and a beer for hubby and only spent $7! 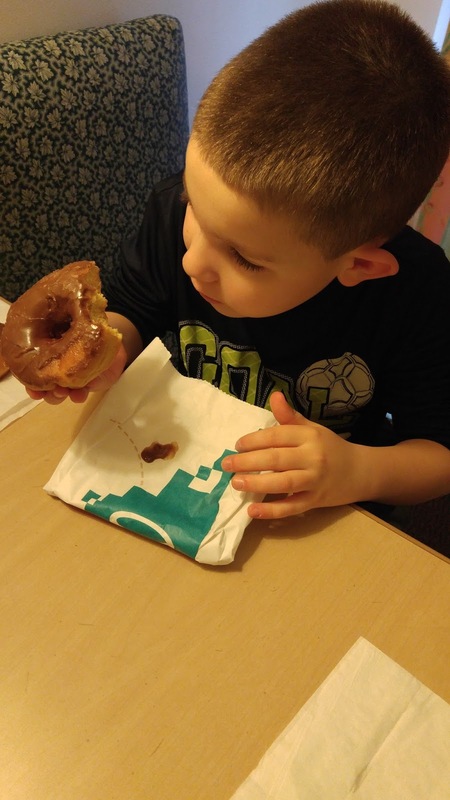 The donuts were perfect for the next morning! 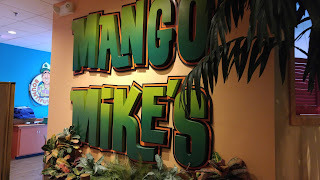 Mango Mike's breakfast buffet is located on the first floor to the right of the main lobby area, just past Ebb & Eddy's. 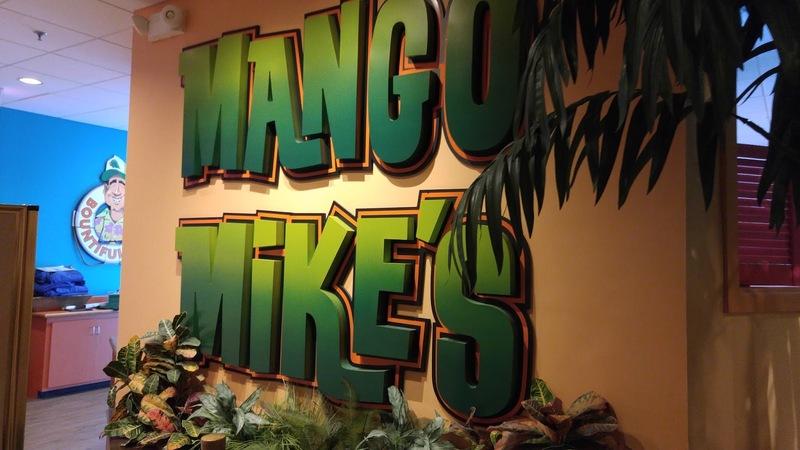 It is a short walk down the hallway to Quaker Steak! 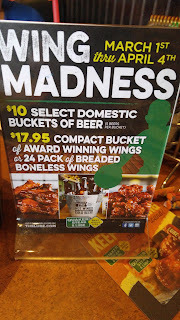 Award winning ribs & burgers, tempting street foods plus Best Wings USA in your choice of 25 signature sauces are available. 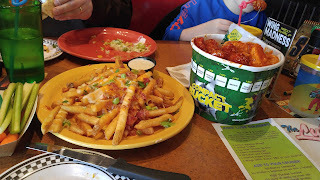 We have been to Quaker Steak & Lube before, but this one seemed more family friendly! 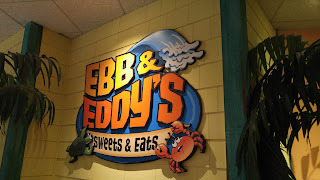 The waitstaff was friendly and prompt! When you have a hubby and son who love wings, this was a hit with them. 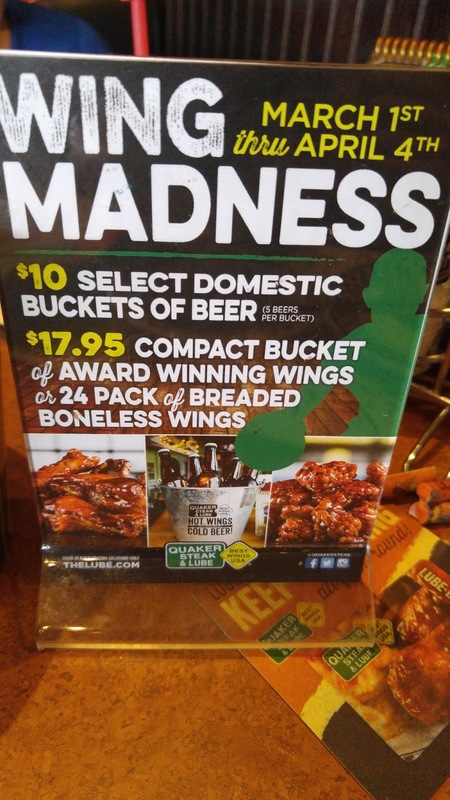 Make sure to check out the specials, we saved money by ordering the special compact bucket or boneless wings and then just paying the extra to have it split into two sauces. A tip our waiter told us when we ordered a bucket was he leaves the caps on the bottles for customers. That way if you don't kill the bucket, you can just take them back to your room! 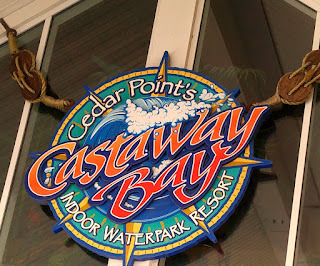 Castaway Bay in Sandusky invited us to enjoy an overnight stay, the water park and dinner recently in exchange for this promotional post. All opinions are my own. No other compensation was received.